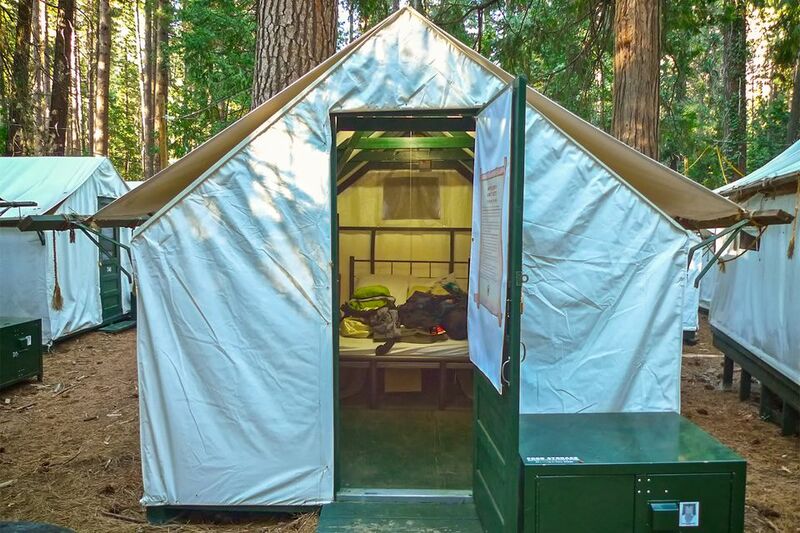 Yosemite's tent cabins offer the lower expenses of pitching a tent but without the bother. Because these facilities are more like a campground than a hotel, none of them have maid service. If you have read about luxury "glamping" in tent cabins, you won't find that experience anywhere in Yosemite. These tent cabins will have a floor and a real bed, but they don't have all the luxuries you might find at privately-owned campgrounds elsewhere. No matter which tent cabins you choose, you need to know how to be safe from bears at Yosemite. Located along the Merced River in Yosemite Valley, Housekeeping Camp has 266 units. Each one is large enough for six people to sleep in it. They are three-sided concrete structures with canvas roofs and privacy curtains. These two-room cabins have a double bed, two single bunks, a table, chairs, mirror, electrical lights, and outlets. Showers and restrooms are centrally located. Bring your linens or rent them for a small fee per day. Each cabin has an outdoor grill and a firepit. Every time I pass by it, Housekeeping Camp seems dusty to me. Even worse is the lack of privacy. The tents are so close together that you can hear sounds coming from your neighbors that you may not want to listen to. Bringing earplugs may help. Everything seems to have changed names at Yosemite. What was previously Housekeeping Camp at Curry Village is still called housekeeping camp, but the area is now called Half Dome Village. So that makes it Housekeeping Camp at Half Dome Village. Spaces at Housekeeping Camp fill up fast, and you will definitely need to know how to make Yosemite camping reservations if you want to stay in one of them. Tuolumne Meadows is a high alpine meadow at 8,775 feet elevation. They have 69 cabins, next to the Tuolumne River and near Tuolumne Meadows. Each one is big enough for four people, equipped with beds and linens. There is no electricity in the cabins, but candles and a wood-burning stove are provided. The campground has central showers and restrooms. At Tuolumne Meadows like everywhere else at Yosemite, bears will break into anything to get food - or something that smells like food. Because of that, you can't leave any food or toiletries in your tent cabin. You’ll be assigned a bear locker near the parking lot to store food items. Toiletries go into a smaller set of lockers just outside the restrooms. People who stay in the Tuolumne Meadows tent cabins either like them or hate them. It depends on priorities and expectations. If you expect to be in a gorgeous location and don't want to sleep on the ground, but don't expect a luxury "glamping" resort, you may like it. The camp is at 8,775 feet above sea level and may not be the place for you if you suffer from altitude sickness. The cabins are available from mid-June through mid-September. All the details are at the Tuolumne Meadows Lodge website. Off Tioga Road in the high country, White Wolf has 24 wood-framed, wood-floored, canvas-covered tent cabins and four traditional cabins. There is no electricity, but the provide candles and a wood-burning stove. They also provide sheets, blankets, pillows, and towels. The tent cabins share central showers and restrooms. The four deluxe cabins here have private baths, limited electricity, and daily maid service. Expect the same policies about bears, lockers, food, and toiletries described above to apply at White Wolf as well. White Wolf is open from mid-July through early September. Get more information at the White Wolf Lodge website. Yosemite Pines near Groveland is an RV resort, which also has cabins and yurts for rent. But the really fun thing to do there is to rent one of their Conestoga wagon replicas, with all the luxury amenities.